Automated external defibrillators, or AEDs, are electronic devices designed to recognize cardiac arrhythmias and treat them through defibrillation, an electrical therapy shock that allows the heart to reestablish its proper rhythm. Modern AEDs are designed to administer the shock only if an abnormal rhythm is detected, and will prompt the user with step-by-step audible or visual cues. The UW Police Department (UWPD) officers carry AEDs in their vehicles at UW Seattle; all officers are trained in their use. While there are some exceptions, state and local law does not require AEDs be provided in buildings; departments may purchase their own. The University does not provide central funding for AED purchase or maintenance. Organizational units wishing to install one of these devices must budget for both the device and required maintenance. EH&S maintains AED information on its website and serves as the point of contact to assist organizational units wishing to procure AEDs. 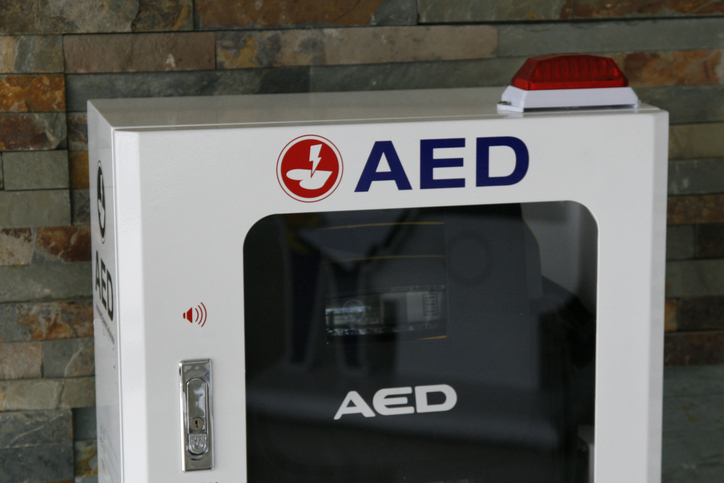 To locate the AED nearest your building, or if you have an existing AED and want to confirm it is in the University inventory, contact EH&S at 206.616.5530. View or download the Procedures for Procuring an AED. For Seattle campus AED maintenance services, contact UW Scientific Instruments at 206.543.5580. Scientific Instruments can provide needed maintenance checks, order supplies and provide a “loaner” device if a unit must be taken out of service. If you use your AED, call Scientific Instruments to service the unit prior to placing it back in service. Select a device that has premarket approval (PMA-510(k)) from the FDA. The American Heart Association endorses many products that have FDA approval. UW Scientific Instruments has replacement parts and experience maintaining Phillips products. Currently, UWPD uses Phillips HeartStart models. When considering a brand and model, consider ongoing maintenance and replacement part costs, and the total cost of buying and maintaining your unit(s). Many companies produce quality AEDs. Whenever an AED is opened and applied to a person, contact the local public health agency. In Seattle call the King County Community AED Program Manager at 206.296.4693. This is a critical step for you to take in assisting the Emergency Medical Services (EMS) system to improve medical care and treatment from sudden cardiac arrest and increase chances of survival. Modern AEDs can provide a printout of a patient's heart rhythms pre- and post-shock. Responding EMS crews may take the unit when transporting a patient or contact a user for follow up to retrieve this information. Any University employees likely to use an AED are expected to receive training on the use of defibrillators. Register for a First Aid/CPR training course. For those outside the Seattle area, training may be available from your local fire department, the AED vendor, the American Red Cross, the American Heart Association and other agencies.